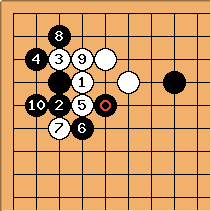 Here , a kado play, leads to some difficult variations, if White doesn't want to submit and allow Black outside influence. 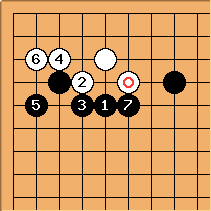 This joseki isn't really current in pro play now: but this main line has been worked out. at is an important variation, as is at (leading to a peaceful result, but no longer adopted by pros, it seems). 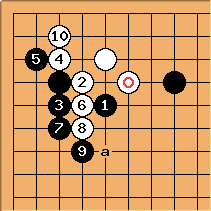 Here the good empty triangle holds Black together, and the serious fighting starts. 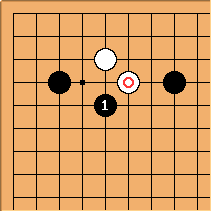 After and , White at a is the old main line; pro games played before this joseki was apparently discarded a decade ago had White at b and c. Obviously the cutting stone is a key stone here: much analysis based on White escaping past or netting the marked stones can be found in books. 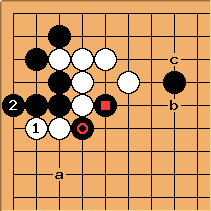 This kado idea has also been tried by Go Seigen when Black's pincer is the low two-space pincer: without its becoming joseki.